I am an admitted Wheel Junkie, and have had always had a set or two of BBS wheels sitting around. LM's, RN's, RA's, RS's, RM's, and OEM BMW BBS wheels as well. From time to time, I run out of room and have to pass a set on to its next owner. All BBS wheels are sold at this time. 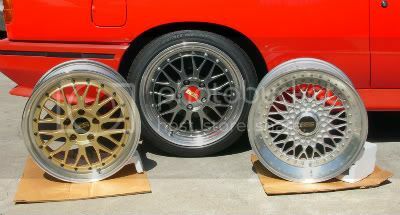 I'm currently refurbishing the set of BBS RS212's seen above, which will be a spare set of wheels for the M3.